The Objective Short-Term Drought Indicator Blend Percentiles map approximates drought-related impacts that respond to precipitation (and secondarily other factors) on time scales ranging from a few days to a few months, such as wildfire danger, non-irrigated agriculture, topsoil moisture, range and pasture conditions, and unregulated streamflows. The Objective Long-Term Drought Indicator Blend Percentiles map approximates drought-related impacts that respond to precipitation on time scales ranging from several months to a few years, such as reservoir stores, irrigated agriculture, groundwater levels, and well water depth. 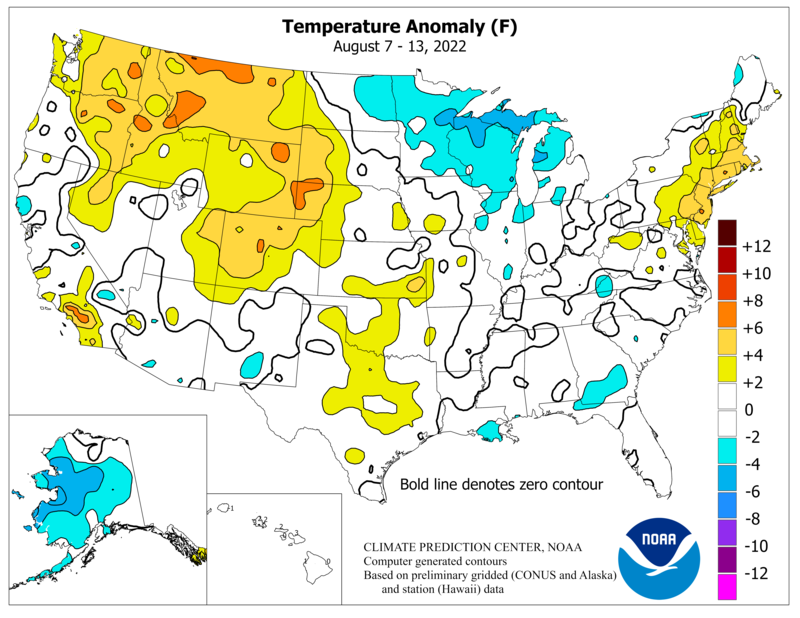 These maps are produced weekly by the National Oceanic and Atmospheric Administration’s Climate Prediction Center and National Climatic Data Center. The Vegetation Drought Response Index maps are produced every two weeks throughout the year and give an indication of vegetation conditions across the continental United States. The Weekly Weather and Crop Bulletin is jointly prepared by the National Oceanic and Atmospheric Administration and the U.S. Department of Agriculture. The bulletin is published weekly on Tuesdays. 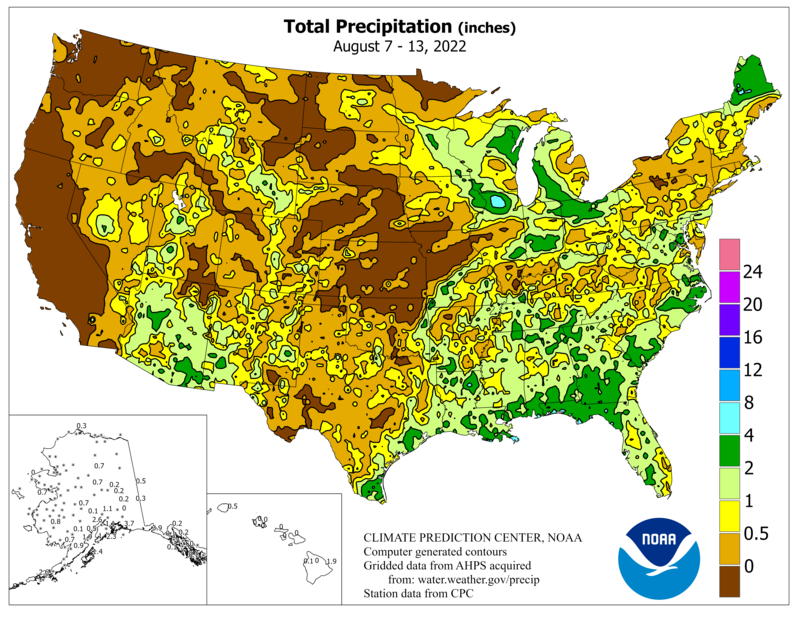 The precipitation analysis pages by the National Weather Service graphically show the short-term observed and climatic trends of precipitation across the lower 48 United States (CONUS) and Puerto Rico. 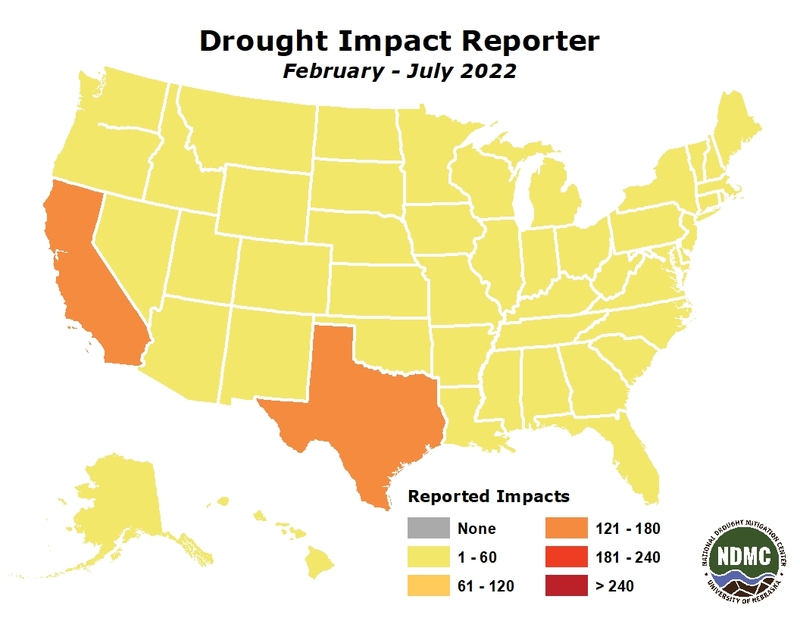 The U.S. Drought Impact Reporter is an interactive tool developed by the National Drought Mitigation Center at the University of Nebraska-Lincoln to collect, quantify, and map reported drought impacts. The tool was created in response to the need for a national drought impact database. Information comes from media, the general public, CoCoRaHS volunteers, and federal and state agencies. 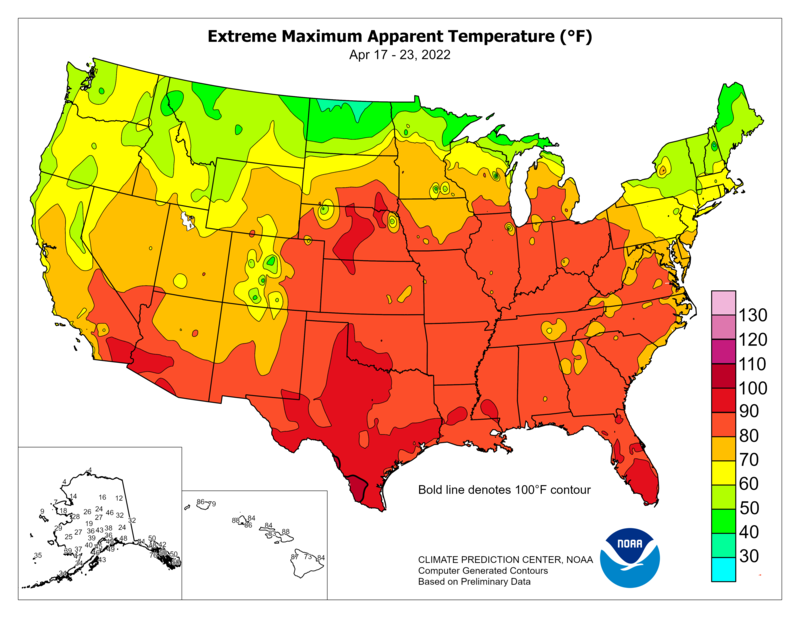 The PDSI is updated weekly by the Climate Prediction Center. It is based on rainfall, temperature and historic data, and is computed based on a complex formula devised by W.C. Palmer in 1965. One advantage of the PDSI is that as a strictly numeric product, PDSI values can be computed back to the beginning of the historic record. Disadvantages of the PDSI are that it is slow to detect quick-onset droughts, and does not reflect snowpack, an important component of water supply in the western United States. The Palmer was the main drought index in the United States before the U.S. Drought Monitor. The Crop Moisture Index, updated weekly by the Climate Prediction Center, is a derivative of the Palmer Drought Index, designed to reflect quickly changing soil moisture conditions. The SPI is a relatively new drought index, based only on precipitation. The SPI can be calculated for a variety of time scales. This flexibility allows the SPI to be useful in both short-term agricultural and long-term hydrological applications. The product displayed here is based on data from the National Climatic Data Center, and on analysis by the Western Regional Climate Center. This product shows the 60-day SPI and is updated daily. 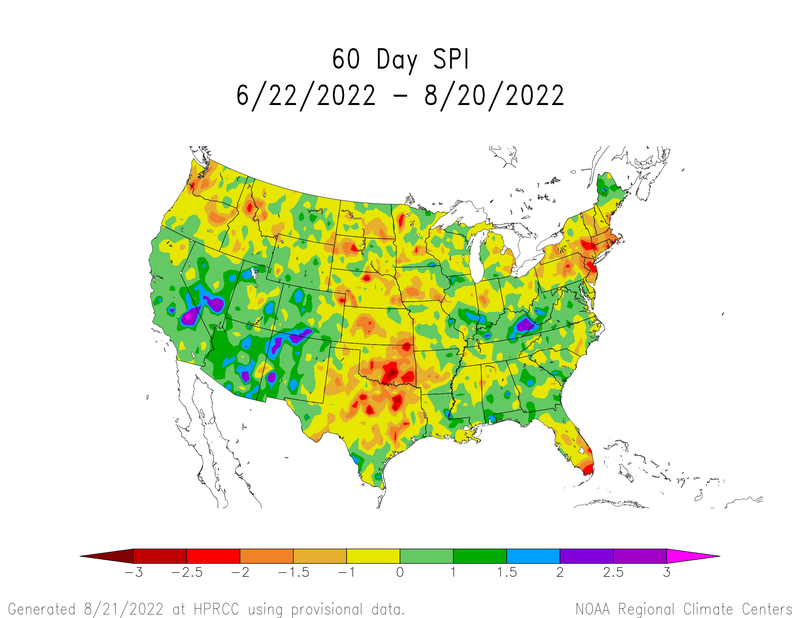 More daily SPI maps are availabe at the High Plains Regional Climate Center (select 60 day from the drop down menu). Percent of normal rainfall for the past 30 and 90 days, updated daily, from the Climate Prediction Center. Based on comparisons with data from 1963 to 1995. The U.S. Geological Survey’s WaterWatch site provides daily updates to the Current Streamflow map, based on conditions as measured at USGS gauging stations. The colors represent discharge as a percentile, which is computed from the period of record for the current day of the year. Only stations having at least 30 years of record are used. WaterWatch includes other related maps based on streamflow measurements. The National Water and Climate Center, Natural Resources Conservation Service, U.S. Department of Agriculture, updates snowpack maps monthly from fall to spring. Click the map to see current topsoil conditions. 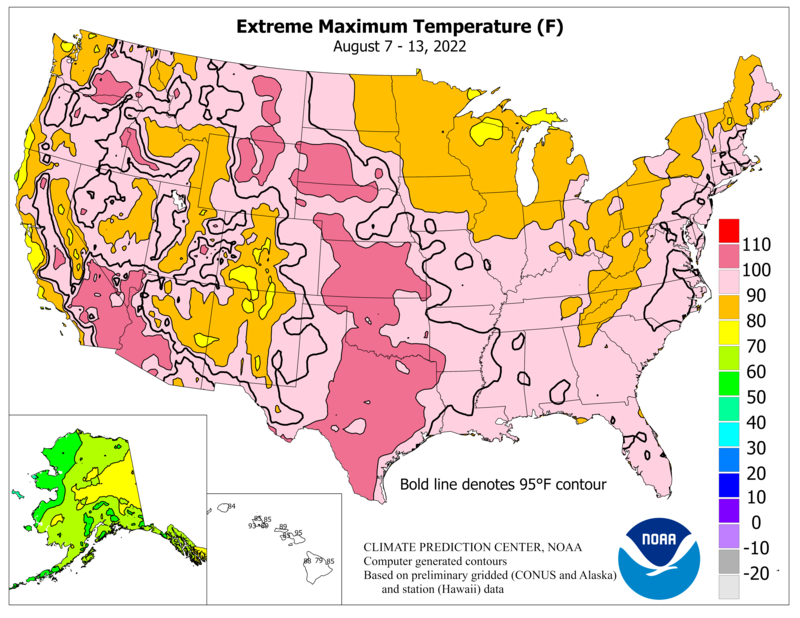 Click the map for a depiction of current topsoil moisture vs. 5 year mean. Click the map for a depiction of current topsoil moisture vs. 10 year mean. NOAA’s National Environmental Satellite, Data and Information Service (NESDIS) produces several satellite-based maps showing vegetation health. 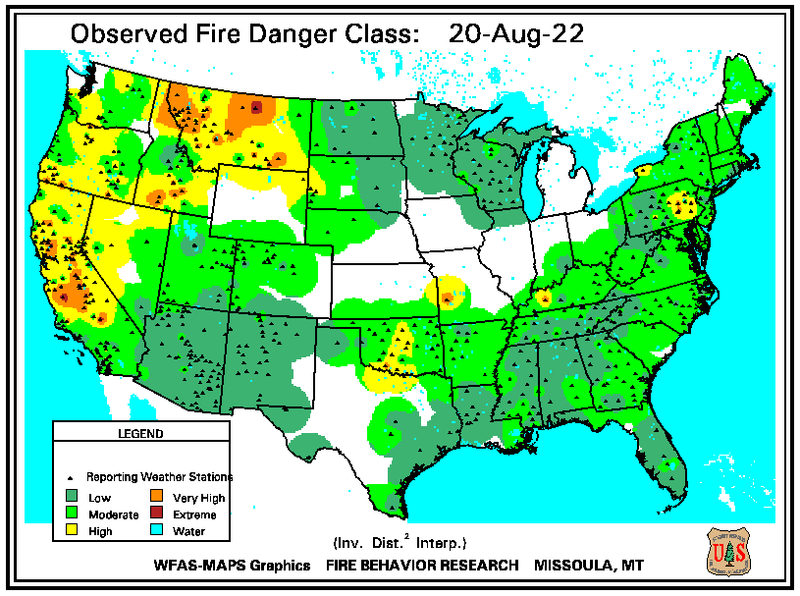 The USDA’s Forest Service produces several maps showing various fire risks. The Observed Fire Danger Class map takes into account current and antecedent weather, fuel types, and both live and dead fuel moisture. 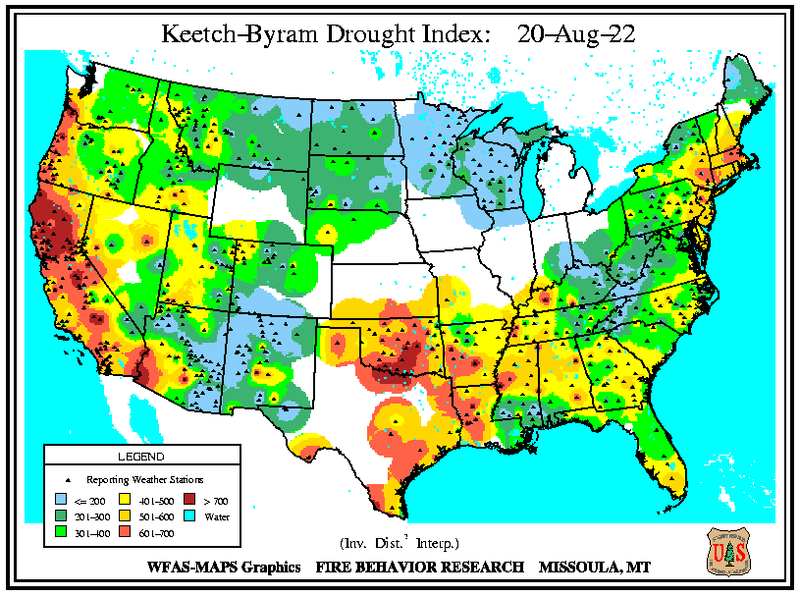 Keetch and Byram (1968) designed the Keetch-Byram drought index specifically for fire potential assessment. It is a number representing the net effect of evapotranspiration and precipitation in producing cumulative moisture deficiency in deep duff and upper soil layers. It is a continuous index, relating to the flammability of organic material in the ground. See details. 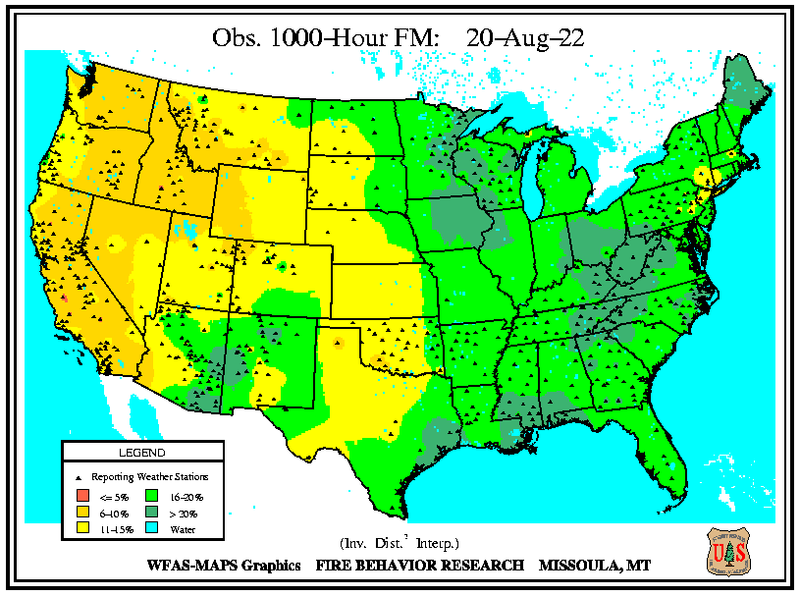 The Observed 1000-Hour Fuel Moisture map shows dead fuel moisture, which responds solely to ambient environmental conditions and is critical in determining fire potential. Dead fuel moistures are classed by timelag. See details.